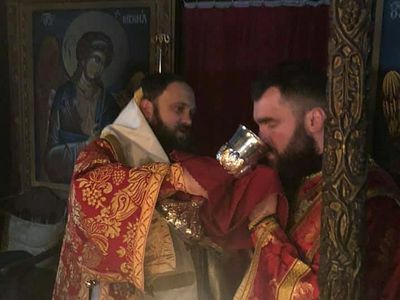 The Ukrainian schismatic church has posted a report on the recent visit of its delegation, headed by “Bishop” Paul of Odessa, to Mt. 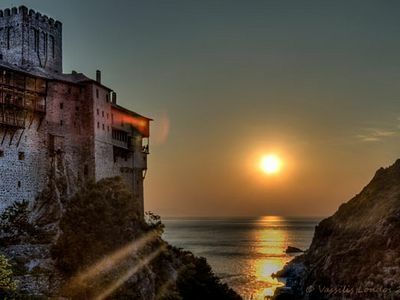 Athos from February 7 to 10. The group also included three “archpriests,” one “protodeacon,” and two pilgrims. At present, it is unclear how much of the report is reliable. Some of the information contradicts that which has been previously reported. The report also makes no mention of the fact that at least 3 monasteries—St. Panteleimon’s, Dochariou, and Zographou—closed their doors to the delegation. Moreover, the group was instructed by Pat. Bartholomew to visit all 20 main monasteries on the Holy Mountain, though only 9 monasteries are mentioned, in addition to 3 sketes. It is unclear if they attempted to visit the other monasteries. In total, the report states that the delegation served Liturgy at two monasteries, communed at a third, and served a moleben at a fourth. They first went to Karyes, the capital village of Mt. Athos on the morning of February 7, where they venerated the miraculous Axion Estin (It is Truly Meet) Icon in the Protaton Church of the Dormition of the Mother of God. 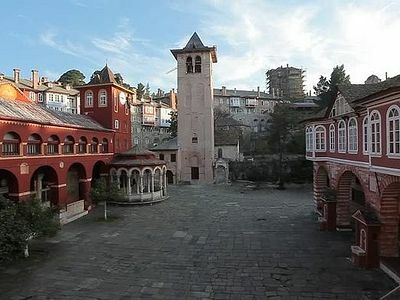 The first monastery visited was the nearby St. Andrew’s Skete, where the delegation venerated the relics of St. Andrew the First-Called. They then visited Koutloumousiou, where they prayed before the wonderworking All-Merciful Intercessor Icon of the Mother of God and a particle of the Life-Giving Cross of the Lord. Hieromonk Chrysostomos of the St. Panteleimon’s Skete under Koutloumousiou attended and celebrated at the enthronement of “Metropolitan” Epiphany Dumenko, the schismatic primate, in Kiev on February 3. The delegation then served a moleben before the wonderworking Iveron Icon of the Mother of God at Iveron Monastery. The delegation then went to Pantocrator where, as OrthoChristian has reported, they celebrated the evening service and the Divine Liturgy the next day. Following the Liturgy, the schismatic delegation met with Abbot Gabriel and the brethren of the monastery. The delegation then met with representatives from the Athos administration, though it is not clear who is being referred to. They had a long conversation about the situation in Ukraine and the supposed wave of parish transitions from the canonical to the schismatic church. While Ukrainian media regularly reports that 200-300 parishes have switched, the canonical Church seriously contests this number. 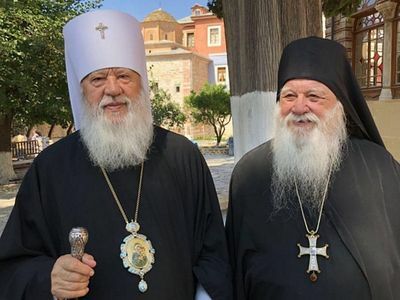 They then visited New Esphigmenou, as previously reported, where they were “warmly received” and the abbot Archimandrite Bartholomew expressed support for the so-called “Orthodox Church of Ukraine” and its primate, Epiphany Dumenko, according to the schismatics’ report. The group then moved on to Stavronikita Monastery, where they venerated a number of wonderworking icons and holy relics. They then visited the cell of St. Nicholas the Wonderworker, known as Burazeri. In the evening, the delegation arrived at Simenopetra, where they report that they spent the night. The next morning, February 9, the schismatics reportedly prayed and communed at the early Liturgy in Simenopetra. After breakfast, they visited the monastery’s library. This contradicts earlier reports that the group was allowed to venerate relics at Simenopetra but not to actually enter the monastery courtyard. The delegation then visited the Old Russikon Skete near St. Panteleimon’s Monastery. No mention is made in the schismatics’ report of their unsuccessful attempt to visit St. Panteleimon’s. They then visited Xenophontos where Abbot Alexios was reportedly “delighted” to receive them and invited them to speak in the trapeza. The abbot, who had served at the enthronement of Epiphany Dumenko, expressed his words of support of the schismatic primate and all the clergy and the people of the schismatic church, assuring them that the brethren pray for them every day. The delegation then went to Dochariou Monastery, where they report that they venerated the wonderworking She Who is Quick to Hear Icon. Again, there is no mention that the monastery actually closed its doors to the delegation and would not receive them. The icon itself is in a chapel before entering the main part of the monastery. The schismatics then traveled to Vatopedi where they met with the brethren, visited the museum, and spent the night. According to their report, “Bishop” Paul and the “clergy” with him served the Liturgy there in the morning, with the brethren of the monastery. The delegation met with the brotherhood again after Liturgy, where they read a letter of gratitude from Epiphany Dumenko. 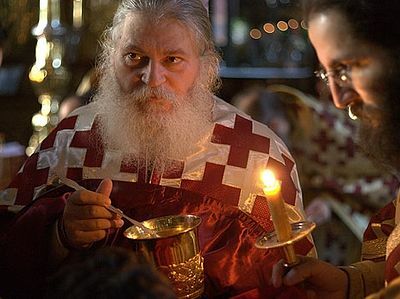 Hieromonk Maximos of Vatopedi also served at Epiphany’s enthronement. Abbot Ephraim was also to attend under an ultimatum from Patriarch Bartholomew, though, due to the extreme stress and pressure from Constantinople, he suffered a heart attack soon after landing in Kiev. The delegation left Mt. Athos after visiting Vatopedi. The Sacred Community of Mt. 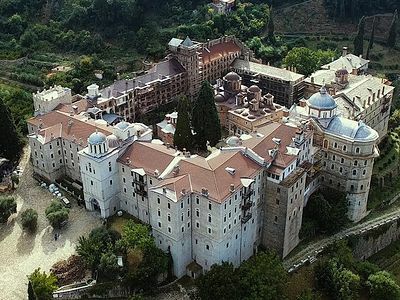 Athos resolved at an extraordinary session yesterday, January 28, to reject Patriarch Bartholomew’s request that they send a delegation to the enthronement of Constantinople’s schismatic Ukrainian primate, “Metropolitan” Epiphany Dumenko, in Kiev on February 3.